I Studied Fine Art at Newport Art College under Keith Arnatt, John Selway, Jack Crabtree and Ernie Zabole. (1976-80) After gaining a BA Hons Fine Art at Newport and a Post Graduate Art Teaching Certificate in Cardiff (1980-81), I taught Art and Photography in Cardiff and Glamorgan Schools for over 30 years. In 2013 I was offered the opportunity for early retirement which I gratefully accepted in order to allow me to pursue my artistic interests. Looking for a change in direction for my art work, I attended a highly instructive course on Botanical Illustration given by Debbie Devauden. It proved to be a pivotal decision. 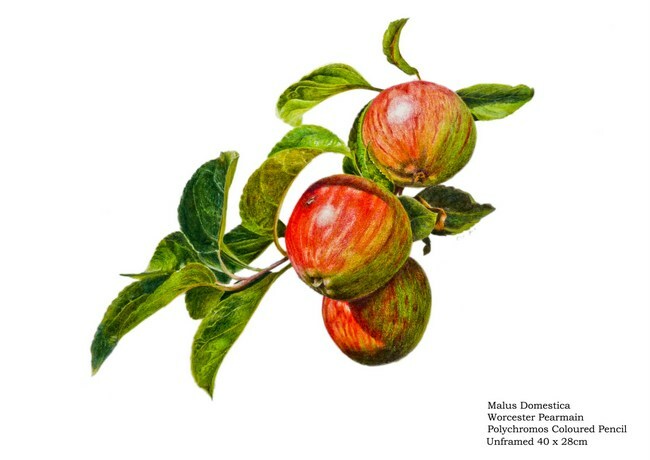 Painting and drawing botanical subjects is both fascinating and challenging. Learning about botanical forms and structures is a crucial element in this art form and greatly increases my appreciation of nature. Since joining the Gloucester Society of Botanical Illustrators in 2014 I have been fortunate enough to have work chosen for each of their Annual Exhibitions at the centre for Art in Nature Gallery & Museum, Gloucester. In 2016 my Polychromos Pencil drawing of Walnuts and Almonds won the Peoples’ Choice Award. I have also exhibited in Llantarnam Grange Art Centre, Cwmbran. I use both watercolour, graphite and coloured pencil in my illustrations and try to grow or locally source my subject matter. I have undertaken a number of commissions and take great pleasure in working on subjects that have a special meaning for the recipient. Each new subject presents its own challenge and requires careful, patient study and often hours of drawing and colour matching before a composition can be considered.